Today was the annual Bicycle Music Festival that our friend Paul coordinates. Some of you may remember Paul (aka: Fossil Fool) as the bike-powered dj at our wedding. Rob and I loaded up the family wagon (sadly, not a bike) and headed to Golden Gate Park to join the fun. Harper and I danced to the pedal-powered music and Ira chased balls and took an unexpected plunge in the duck pond. All told, we had a wonderful afternoon and are becoming much more comfortable with “family style” adventures. We where reminded how lovely Golden Gate Park is and how we never hang out here. With miles of nicely paved paths (aka: great for strollers), we are sure to visit more often. 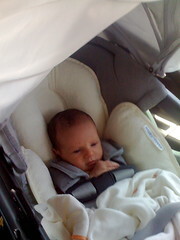 Harper took her very first car ride today in her fancy-pantsy carseat. We tested the fit and function of the carseat the day before and found that, while the straps adjust to fit, it looks about 8 sizes to big for her. Harper was not a big fan of being strapped into the seat but once Rob picked up the handle and started down the stairs she stopped crying and remained content all the way to Oakland and back. Yay!